Perdition Temple is an American Black/Death metal band hailing from Florida. The band features two former members, Gene Palubicki and Bill Taylor from the excellent blackened death metal band Angelcorpse that split up in 2009. 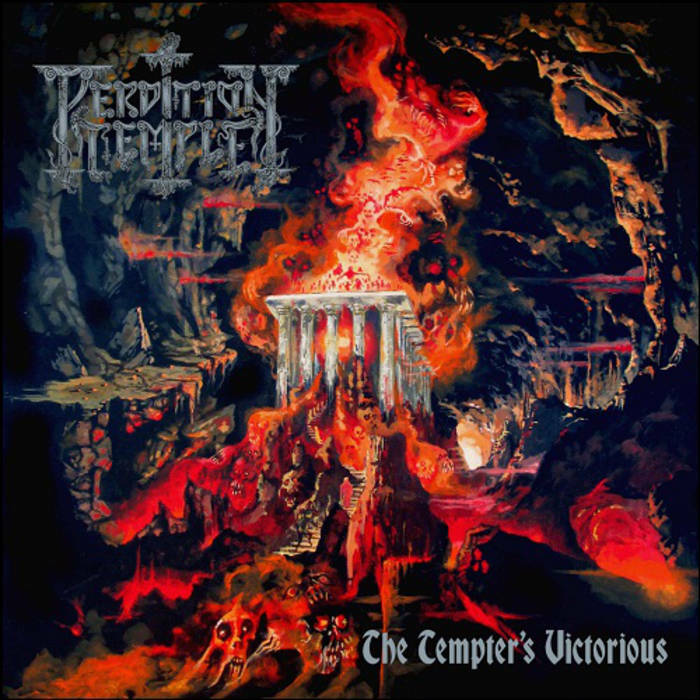 Perdition Temple is the demon spawn that grew forth after the Angelcorpse split and The Tempter’s Victorious is their sophomore record hoping to build on from their debut full length Edict of the Antichrist Elect from 2010. The opening title track wastes no time in trying to annihilate your ears. It is clear from the start that this is a continuation off their debut full length with pummeling blast beats and extremely fast tremolo picked riffs. The influence from their Floridian brothers in Morbid Angel are obvious because the riffs sounds like something that easily could come out of Altars of Madness or Blessed are the Sick. Bill Taylor off Immolation fame, also brings a lot to the table and manages to contribute in creating the perfect atmosphere for a blackened death metal album. Since their debut, Perdition Temple has also changed vocalist and the man managing the growls is now Impurath, vocalist of US black metal band Black Witchery. Impurath has bestial growls that fans of bands like Diocletian and Dead Congregation are going to appreciate to the fullest. During the 37 minutes of full on relentless death metal assault the band gives you no time for a break. For the untrained ear, the album may sound like a one big blur of blast beats, double bass and growls, but there are tons of great riffs and a lot memorable songs. “Chamber of Predation” is maybe the song that stands out for me personally with a really cool passage about two minutes and twenty seconds in where the bands slows things down a bit and then goes fast again. Tracks like Chamber of Predation and Devil’s Blessed could be featured on Altars of Madness and they would be hailed as death metal classics. The production is also worth mentioning because it is solid as a rock. All instruments are clearly audible and the guitar tune is very tasty. The drumming is excellent and the blast beats are always on point. I do feel the album could do with a couple of more breaks where they slow down because it is apparent that this is something that Perdition Temple masters to the fullest. The Tempter’s Victorious is what Illud Divinum Insanus should have sounded like. It is everything that made Angelcorpse so good and it’s all you would want from a Morbid Angel album packed into one punishing death metal record. Overall, it’s an album that carries on the Angelcorpse legacy with pride and for some may even outdo the former band. The Tempter’s Victorious is one of the best death metal releases of 2015 thus far and I seriously doubt there are going to be many death metal releases that outdo this album this year.